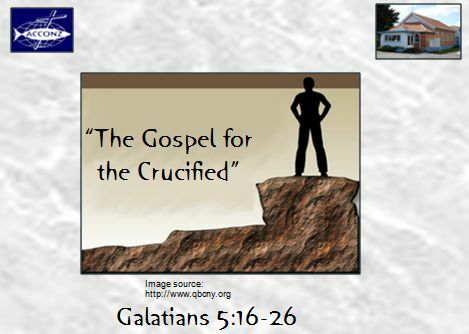 The Gospel for the Crucified (Gal. 5:16-26). But I say, walk by the Spirit, and you will not gratify the desires of the flesh. 17 For the desires of the flesh are against the Spirit, and the desires of the Spirit are against the flesh, for these are opposed to each other, to keep you from doing the things you want to do. 18 But if you are led by the Spirit, you are not under the law. 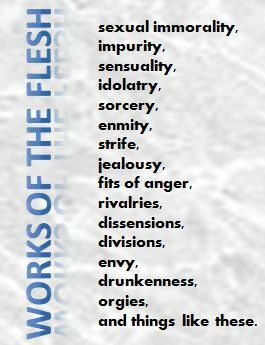 19 Now the works of the flesh are evident: sexual immorality, impurity, sensuality, 20 idolatry, sorcery, enmity, strife, jealousy, fits of anger, rivalries, dissensions, divisions, 21 envy, drunkenness, orgies, and things like these. I warn you, as I warned you before, that those who do such things will not inherit the kingdom of God. 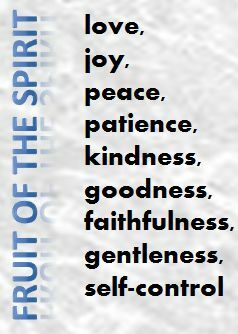 22 But the fruit of the Spirit is love, joy, peace, patience, kindness, goodness, faithfulness, 23 gentleness, self-control; against such things there is no law. 24 And those who belong to Christ Jesus have crucified the flesh with its passions and desires. 25 If we live by the Spirit, let us also walk by the Spirit. 26 Let us not become conceited, provoking one another, envying one another. Today’s text is one of the most popular from the book of Galatians. Portions of it are probably read and preached more than any other in the book. But I am glad I did not decide just to jump into this text. I’m glad we have been hanging out in the whole book of Galatians for the past five months. Along the way we have discovered the historical and cultural context in which these words were first applied. This context is going to help us see more clearly what Paul is saying, and to whom and how it applied in the first century. 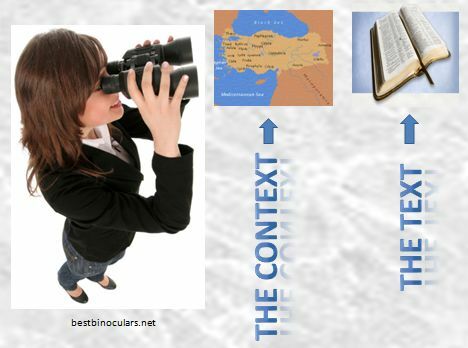 That knowledge will also help us put the text in practice here in the 21st century. 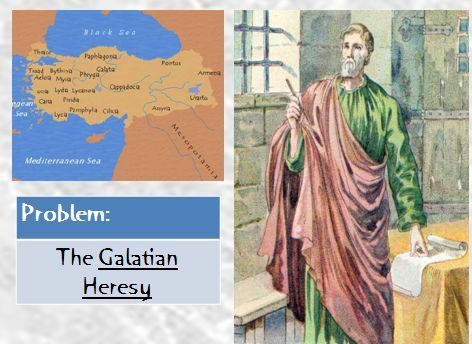 In summary, that context is this: Paul had been responsible for planting the churches of the Galatian region of the Roman province of Asia Minor. After he went on to plant more churches elsewhere, some false teachers came into those churches and promoted a new way of looking at Christianity. Paul called those false teachers “troublers” and that is exactly what they did – they caused trouble. They taught that once you come to Christ by faith you then need to add something called “the works of the law” to that faith. Apparently the “works of the law” included circumcision, Jewish dietary restrictions, and strict obedience to the Mosaic laws as interpreted by these teachers. 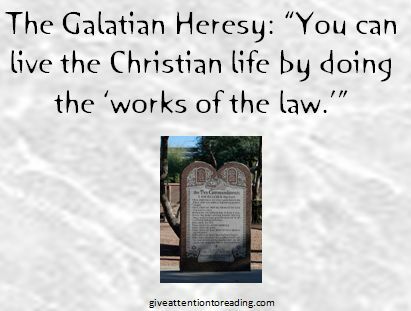 So let me now venture a definition of the Galatian heresy based on what we have seen so far in Paul’s letter. 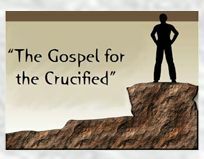 It appears that the troublers were certain that anyone coming to Christ by faith were going to need some extra help living the life they have committed themselves to. So, they offer this advice: “if you want to live the Christian life, and please God, and succeed at being a believer, you need to add these “works of the law.” They are the secret ingredient that will help you produce the godly character you know God expects. If you go to the average Christian bookstore you will find lots of books that claim to have the secret of living the Christian life. It is something we all want. That real desire in Christians is something the troublers were exploiting. The ones who didn’t have their act together envied those who looked like they did, and everybody was making everyone else miserable. You didn’t want to plan your next conference at Galatia. It was not the place anyone wanted to be. So he was telling them that there was a war going on inside of them. Every time they decided to do something good in their own power, their sinful nature turned it into something evil. Every Christian has this war going on inside him. So, no matter who you are, whether you are saved or not, whether you have been raised in a Christian home or not, whether you are home schooled or not, whether you went to Bible college or not… If you are trying to live the Christian life in your own strength you are going to produce the works of the flesh (19-21). This is serious, because the only way the world is going to know that we Christians have found the Answer in Christ is that we manifest the fruit of the Spirit. If we are operating out of the flesh, we will produce what the flesh produces. That is not a good résumé. 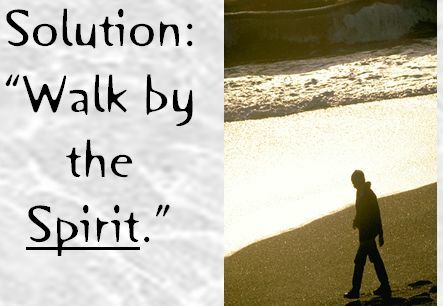 So Paul’s solution (in verse 16) is for them to walk by the Spirit. That means letting the Holy Spirit be the controlling power in their motivations, and the deciding influence in their actions. That is being led by the Spirit (18), which is passive. It being passive makes it harder for us because it involves letting the Holy Spirit take control and do what God wants to do in our lives, not what we want to do, and it means doing what God wants to do in his way, not our way. But that is the only way we are going to produce the Spirit’s fruit, instead of our own fruit. Jesus said “By this my Father is glorified, that you bear much fruit and so prove to be my disciples” (John 15:8). He also said “I am the vine; you are the branches. Whoever abides in me and I in him, he it is that bears much fruit, for apart from me you can do nothing” (15:5 ). 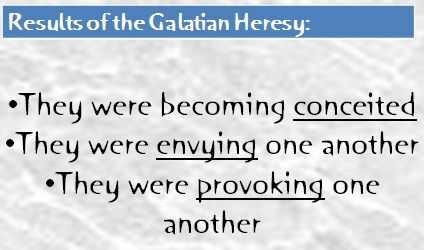 That reinforces the idea that Paul is getting across to the Galatians. Fruit bearing is passive: God wants to grow the fruit on us. The zillion dollar question is “how?” How do we stop operating out of the flesh, and passively allow God to change us so that we manifest the fruit of the spirit instead of the works of the flesh? We have to understand that the Christian life is just that. It is a life, not just a decision. Lots of people make a decision to invite Christ into their lives and then never cultivate that life. 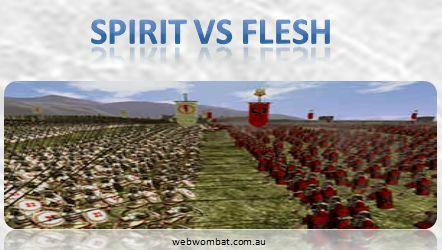 They keep on living out of the flesh; they never walk by the Spirit. Those people are not saved, because their decision for Christ was not a repentance. Paul had experienced that true repentance. He said in Galatians 2:20 “I have been crucified with Christ. It is no longer I who live, but Christ who lives in me. And the life I now live in the flesh I live by faith in the Son of God, who loved me and gave himself for me.” That’s the kind of life he is calling on the Galatians to live. But again, the question is “how?” Once we have truly repented of living life our way, and submitted to the Holy Spirit, how do we know that the desires and passions we now have are coming from the Holy Spirit, and not our flesh? 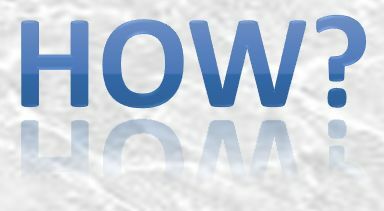 One clue is the question Paul asked in Galatians 3:5 “Does he who supplies the Spirit to you and works miracles among you do so by works of the law, or by hearing with faith?” Here Paul reveals how God chooses to work. Through his word he motivates us to do his will. But how is that different than what the Judaizers were saying? The difference is the one who initiates the change. This message is part of a 15 sermon series on the book of Galatians. It was taught at Takanini Church of Christ, Auckland, New Zealand on Sunday, September 26th, 2010. I am guilty of sometimes trying to live the Christian life in my own strength and with my own planning. Only when I reach the heavy tears and runny nose crying do I finally “get it”…again…and give it to God. Thanks for the reminder Jeff.